"Silencio" is the frustrating case of a movie that plants a whole lot of magic beans that simply fail to grow: a special stone that has time travel and clairvoyant abilities, a ghost named Lisa, a man who can talk to said ghost, an older man whose brain is “asleep” until someone says three words to him, and a patch of land in Mexico called the Zone of Silence. It's one of the year's most convoluted original screenplays, but is probably best taken as a test in plot summarizing. In a pitch, it's an overcomplicated adventure about re-finding said magic stone, after it was first discovered by a scientist (John Noble’s James) and his young assistant Peter (Nic Jackman). In 1970, while investigating a missile crash site in the radio communication no-man's-land known as the Zone of Silence, they uncover a highly radioactive rock. But when James touches it, it takes them back in time to an earlier personal tragedy, and helps him save the life of his young granddaughter, who originally died a week before the rock was even found. Now, decades later, Ana (Melina Matthews) is a therapist and mother, who doesn't know about her previous quasi-resurrection through stone-holding time travel. But she now takes care of her grandfather James, his mind “asleep” as he sits staring off into space in their home in Mexico. One of Ana’s patients, Matthew (Michel Chauvet) tells Ana that her sister Lisa (who died in the accident along with the rest of the family) wants her to “wake up” her grandfather and find the stone, which James buried somewhere years ago, but forgot where. She is able to wake him up, by saying the word “three” three times to him, but in his limited hours of consciousness he can’t find the stone in the cemetery where he buried it. But wait, there’s more: Someone else who wants the stone sends a hired hand to pressure the family, who goes so far as to kidnap Ana’s son Felix (Ian Garcia Monterrubio), whose asthmatic condition is later piled onto the script's teetering heap of stakes. When James is knocked out during one of the movie’s over-baked moments of violence, it’s up to Ana, Matthew, and the ghost of Lisa to find the stone, using an old map. They receive some help from Peter (who now lectures about the Zone of Silence, and is played by Rupert Graves), who speaks to Ana about the stone's abilities midway through the movie. This is about the only time “Silencio”’s self-made metaphysical rules make sense. Along with an ever-assertive score, the performances are suffocated by the film's melodramatic ambitions, putting actors in lose-lose scenarios: Noble’s absurd passage when he scuttles to find the stone constantly verges on overacting. The same hamminess comes in later character revelations, big twists that are also unraveled by logic when you think about them for more than two seconds. 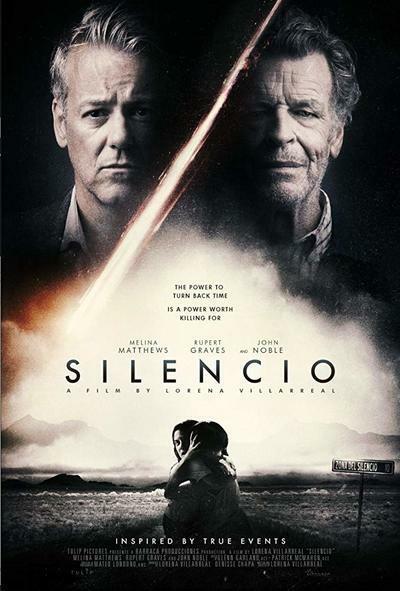 As Matthews becomes the lead to the script's mess of convoluted character arcs, it becomes exhausting to try to feel something from "Silencio," never mind watching a lead try to simply make sense of it all. One arching theme does provide an often absent sense of clarity—the importance of family. But as much as the movie is loaded with sunlight-kissed flashbacks to calmer memories of bonding —James consoling his young granddaughter shortly after the tragedy, or the two of them sitting together in tranquility when she’s pregnant with Felix—there’s nowhere near enough emotional tissue to connect all of "Silencio"'s ideas. As it uses grounded sci-fi and fantasy elements without much eloquence about death, fate, or even family, “Silencio” proves to be more concerned with treacly sentimentality than sturdy storytelling.